BOOK NEWS: Suzanne Collin's 'THE HUNGER GAMES' Gets A Sleeker New Collectors Edition! 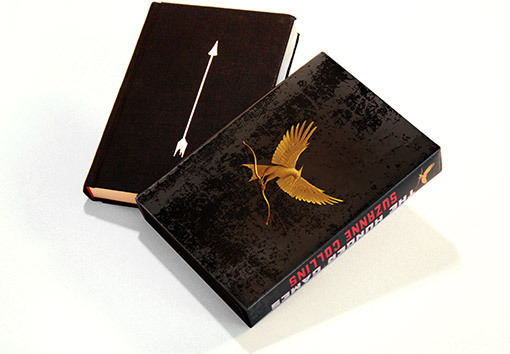 Scholastic, the world’s largest publisher and distributor of children’s books is set to release a new collector’s edition of Suzanne Collins’ The Hunger Games that will include new, redesigned Mockingjay artwork, foil stamping, a special protective slipcase with the said new redesigned Mockingjay displayed on the front slipcase. Scholastic editorial director David Levithan recently chatted to EW on the new design. The special edition will be available from November 28th, with a retail price of $30, though it's listed online at the Scholastic Store with a sale price of $21.99. Hit the jump for the details. David Levithan: "It’s been fun for the art director and me to revisit the mockingjay images. Amazingly, we chose the mockingjay image for the first book before we knew how crucial it would be in the trilogy, and we concepted the cover directions for Catching Fire and Mockingjay before we’d read a word of either book. Now we have the opportunity to go back and create new icons for each book. The Hunger Games Collector’s Edition shows a mockingjay in flight holding a bow, outside of the pin image featured on the original book, teasing the active role it’s going to play." I'm reading: BOOK NEWS: Suzanne Collin's 'THE HUNGER GAMES' Gets A Sleeker New Collectors Edition!Tweet this!